A good and reliable pair of dress shoes is a must for all working men. These shoes are very versatile and the right pair can be worn for just about any occasion. Oxford dress shoes are a staple for many men’s closets and they deserve that spot because when worn correctly, they can tie in the whole outfit together. Unlike women who need different pairs of shoes, one for the office and another for a night out, men can use the same pair they’ve worn all day and no one will blink an eye, provided that it goes with the outfit. With so many events and occasions dress shoes can be worn to, it only makes sense that you get the best of the best. A durable pair will set you back quite a few dollars, but if they last you years, you know it is worth it. This review will discuss the pros, the cons, and the features that come with the ECCO Men’s Helsinki Cap-Toe Oxford Dress Shoes. After this you can judge whether these specific dress shoes deserve a spot in your closet, or if you need to keep looking for the right pair elsewhere. The ECCO Men’s Helsinki Cap-Toe Oxford Dress Shoes has a loyal following because they deliver on all of its promises. They very comfortable to wear, even for people who are constantly on the go with very little tread wearing. The right kind of ECCO’s can even last up to 10 years; that is how durable and reliable these dress shoes are. Many who have given the brand a try have found themselves staying loyal to the brand because of the comfort and support it offers them. People with wide feet often struggle to find shoes that do not pinch or hurt their feet. Thankfully, the ECCO Men’s Helsinki Cap-Toe Oxford Dress Shoes are designed to comfortably accommodate wide feet so men often find themselves pleased with their purchase. Another big plus for these dress shoes is how the outsoles are connected to the uppers. The melting of the two parts seamlessly secures them together and gives a nice watertight seal to allow users to stay dry even while walking on rainy streets. In case some moisture does get in, don’t worry; these dress shoes easily dry out and are made with the technology that allows it to remain odorless. 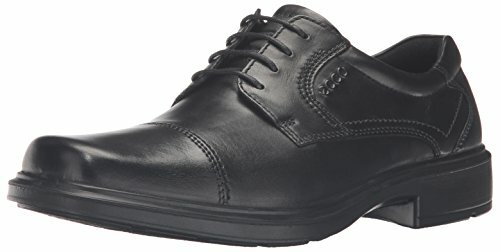 Those who require special cushioning for their feet will also appreciate that the ECCO Men’s Helsinki Cap-Toe Oxford Dress Shoes come with a removable leather insole; this means you can take them out and replace them with custom insoles that give you the proper cushioning your feet need. Another fantastic aspect of these dress shoes that they are lightweight; you can be on your feet moving and walking the whole day without the added weight of the typical dress shoes, which can be a burden if it turns out to be a long day. The ECCO Men’s Helsinki Cap-Toe Oxford Dress Shoes are very stylish and versatile, which is, of course a big advantage. You no longer need to buy another pair of shoes for a formal event because you can use your ECCO’s to attend events without looking under-dressed. You can save money without compromising your style, and that is a definite win-win situation. Choosing the ECCO Men’s Helsinki Cap-Toe Oxford Dress Shoes means you have to pay a good amount of money for them. These shoes are not cheap, and that makes people hesitant to try them. Not to worry, because once you’ve tried them on you’ll never want another pair again. Plus, they last a long time, making them a great investment. Another disadvantage of the ECCO Men’s Helsinki Cap-Toe Oxford Dress Shoes is the break-in period. Although they become very comfortable to wear after a certain time, the break-in period can take a while and can be painful on the feet. Take note that this is due to the upper being made of leather making it a bit difficult to stretch in the beginning. There are also issues with shoes that are manufactured in different countries not lasting as long as others. To avoid this, always check where the shoes are made to ensure you get the best quality possible. The ECCO Men’s Helsinki Cap-Toe Oxford Dress Shoes may come with a hefty price tag, but it’s definitely worth every penny you pay. From the moment you try on a pair of ECCOs, there’s no turning back to any other dress shoe brand out there.